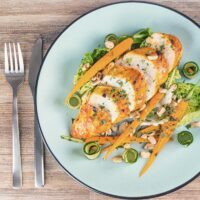 A simply roasted chicken breast in a Thai red curry paste and coconut milk coating form the centrepiece of this insanely tasty Thai Chicken Salad! 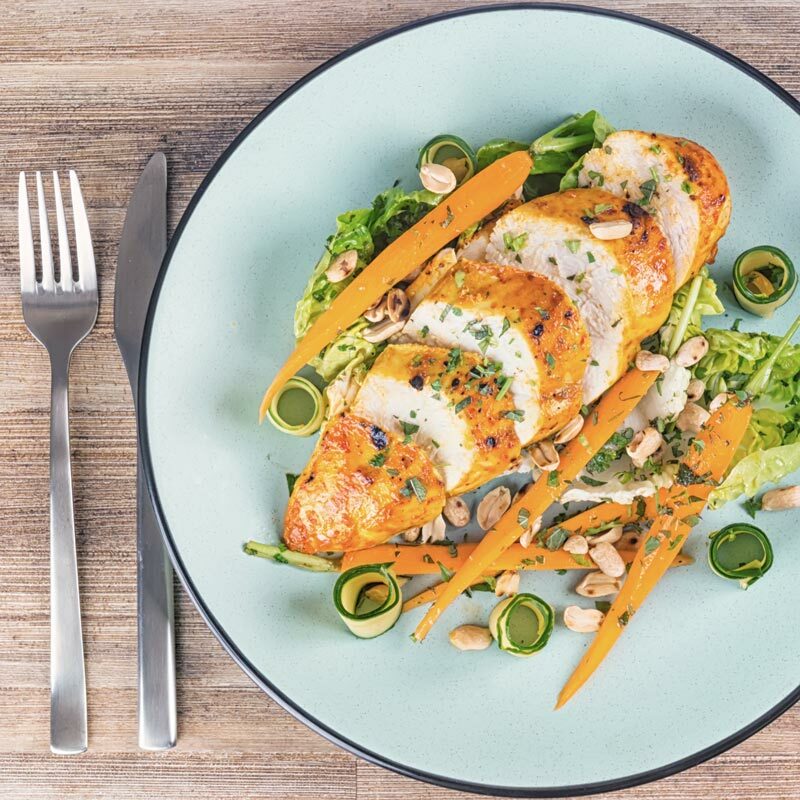 Thai Chicken Salad With Carrots. Main meal salads are definitely a theme on my website this year and this Thai chicken salad is an extension of that. 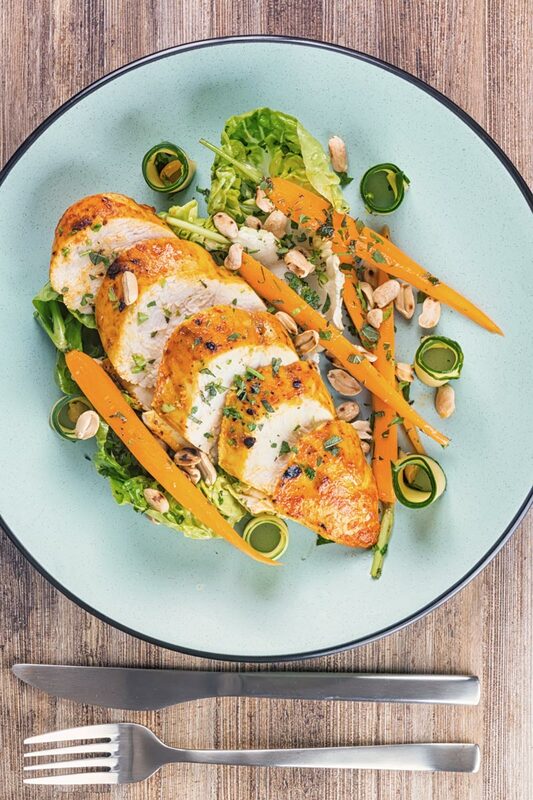 A simply roasted chicken breast forms the heart of this satisfyingly hearty but light and zingy salad. That chicken breast is roasted in a sauce of Thai red curry paste, coconut milk, and fish sauce. You can, of course, use store-bought Thai Red Curry paste but it really is simple to make… I have a recipe for the one I make on this great duck Thai red curry recipe. 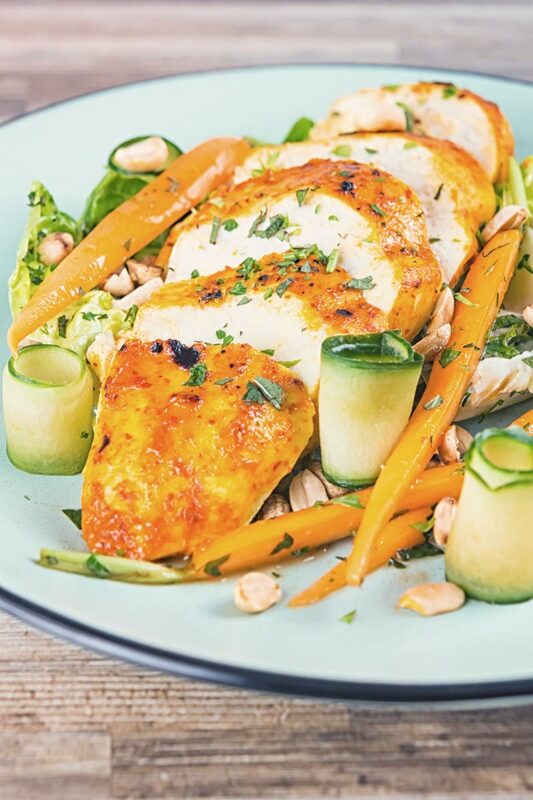 That chicken breast is accompanied by some steeped or cold pickled carrots and cucumber. That steeping liquor feature rice wine, soy sauce and brown sugar to add a sweetness and sourness to the vegetables. Regular readers will know I have a thing for pickles in salads. The pickled peaches in this ham and cheese salad spring to mind! Of course, there is also a punchy sesame oil dressing to pull it all together. Salads mean so many things to so many different people. Everything from side salads to appetizer salads, fruit salads to layered salads… To be honest I have no idea what purpose the latter has, but apparently, they are a thing. Typically I am only interested in main course salads. This Thai Chicken salad typifies my particular definition of a salad. I have a pretty loose threshold when it comes to calling a recipe salad. So, for instance, I would consider this roast pork tenderloin recipe a salad. Pretty tenuous I agree but recipes served largely warmed rather than hot with a focus on uncooked or lightly cooked vegetables are salad territory for me. Of course, there is plenty of room for more traditional salads like this smoked pork tenderloin salad or this smoked mackerel salad. This Thai chicken salad recipe is much closer to what people would expect from a main course salad. A protein source as the centre-piece then a collection of vegetables and a dressing rather than a sauce or gravy. I reckon a chicken Caesar salad has become the most recognisable idea of a main course salad. Even though it was never really a chicken salad. I am sure I have written about my approach to salads before. In many ways, it is no different to my approach to food in general. Make no compromises! Food is meant to be loved and enjoyed and I would rather eat something less frequently than replace ingredients with ones considered to be more ‘healthy’. 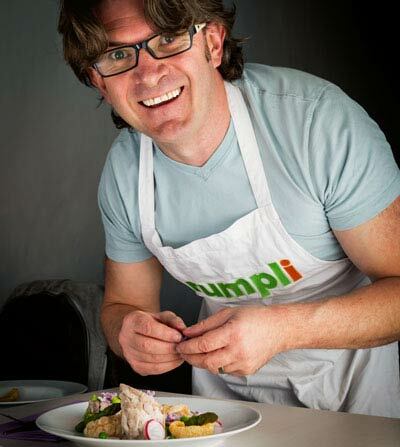 So yes, you will see lots of salads here on Krumpli… No, they are not designed to make you lose weight, no they are not designed to be healthy. They are nutritious, tasty and form part of a healthy diet. No more and no less. Combine the coconut milk with the red curry paste and one teaspoon of fish sauce and marinade the chicken for 30 minutes to an hour. Add all of the ingredients for the dressing to a jar and give it a good shake to form a dressing. Place your chicken in the oven and roast at 200°C or 350°F for 17-20 minutes. Whilst your chicken is roasting separate your lettuce into leaves and place in a bowl and finely cut the mint and coriander. Cut your carrots into halves or quarters (depending on size) lengthways. Toast your peanuts in a dry pan being careful not to burn. Using a vegetable peeler create ribbons of cucumber, working around the cucumber leaving the seeds. Combine the sugar, soy sauce and rice wine for the salad and pour over the cucumber and carrots and allow to sit for 5 minutes. 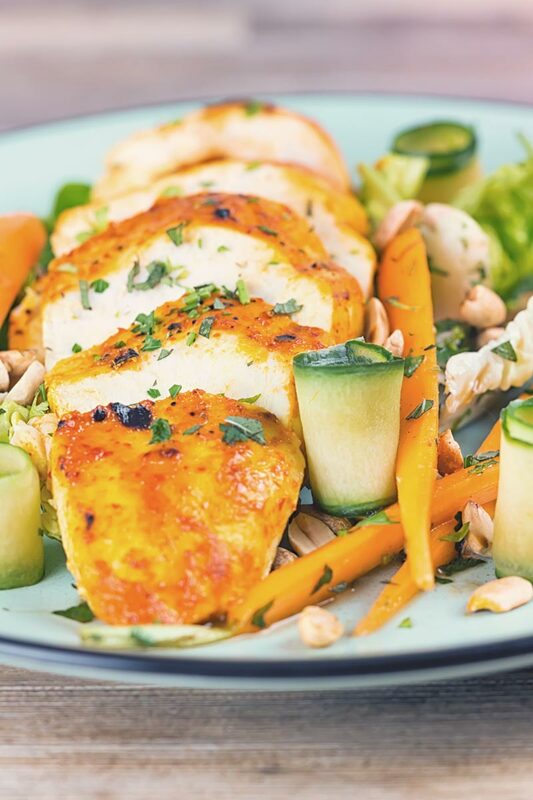 Place the chicken under a broiler to colour for 2 minutes and then rest for 3-4 minutes whilst you plate the salad. Dress the lettuce leaves with the dressing we made at the start and then sprinkle with the chopped herbs. Arrange all the ingredients on the plate before slicing the chicken and serving. Drizzle with a little more of the dressing before serving. What a lovely wholesome summery salad! I love Thai flavours. This looks amazing! 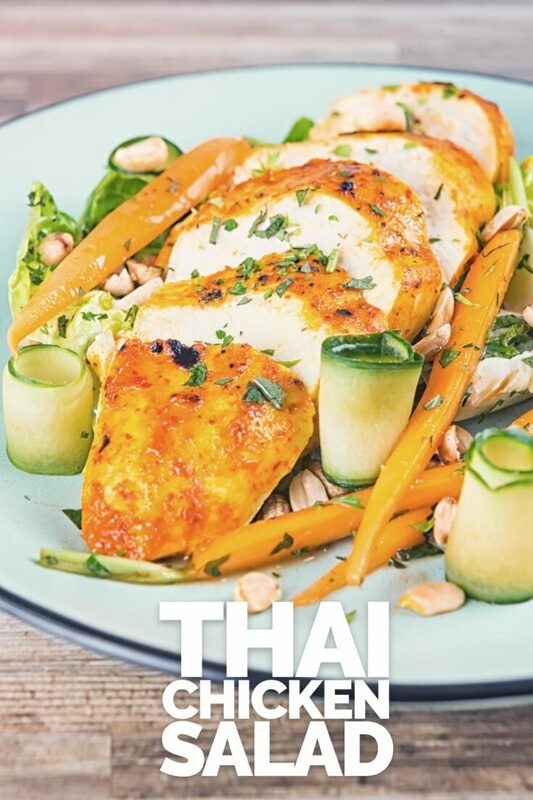 I love the flavors of Thai cuisine – this will make it into my lunch rotation for sure! I am loving all the flavors is this salad. Fish sauce, curry, coconut milk….these are all my favorite things. Great recipe! I love this kind of salad and the inclusion of so many wonderful flavours makes this a mouthwatering recipe. Def one I’d love to try!